Tell the truth in the fewest, simplest words possible. If, like me, you love the most succulent kind of literary fiction, you might guess how I could forget this rule. If, like me, you also aspire to write the same, you know my struggle, because you share it. "Wherever you turn your eyes the world can shine like transfiguration. You don't have to bring a thing to it except a little willingness to see. Only, who could have the courage to see it?" It's easy to be so dazzled by a word like "transfiguration," that something you felt keenly in the reading, the shock of truth, gets obscured when you sit down to "write like that." And how does it get obscured? Why do we hang up on the descriptor, "like transfiguration," and miss the punch: "who could have the courage to see it?" Because there's no Thesaurus for truth. Adverbs and adjectives lie scattered around us. We think truth does, too, but that's an illusion. What we call truth, those warmed over lumps of pre-packaged words that lie closest at hand have come to us from movies and greeting cards and songs and sermons and talk shows and cute little poster things on Facebook and Pinterest. Understand: those non-truth's may actually be true. On occasion they may even be good theology in a way that succulent truth is not. It's hard to see and accept the difference, and believers struggle more than most. We want to be right - especially in our theology. We want to transmit to our readers something we hold precious. It takes courage and faith to loosen our grip on what comes to us packaged and approved. But the kind of truth that is organic to the author, the kind drawn - often painfully - from her own chest, brings a gift that theology neglects. It draws the reader to the quick of her own truth - her own Book of Job questions, and her Jacob-ish drives - to the place where she wrestles with angels. There's no holier ground. So how's it done? How do we tell the truth in the fewest and simplest words possible? We write a lot of words. Personally - much as I love this film - I wonder if Todd Anderson would have found those words, self-conscious as he was, in a classroom full of his peers. But he might have found them if he'd spun circles round words upon words - more words than if he only longed for succulence. Words and words and words till his skin snapped with the shock of truth, and he knew he could cut the rest. Have you struggled as I have with telling the truth? (Please say yes.) What have you brought back from the fray? *I learned this from Jocelyn Lieu's chapter titled Circling the Unsayable, in Words of Thumb, edited by Michael Martone and Susan Neville. Yes, I want to transmit to my readers something I hold precious; and I certainly need the tip, "Tell the truth in the fewest, simplest words possible." Thank you for the nuggets of insight. I have some editing to do. Over the years, I have also learned the big canvas method you advise and it has given such freedom to be creative rather than frugally try to paint only the best of the best on a postage stamp and do it right the first time. It's kind of like the freedom of having a digital camera. I snap away with wild abandon and save only the very best rather than agonizing over film and developing costs only to get one good picture out of 24. Yes, I create plenty of slag and then mine. I weave bountiful loomfuls and then cut and stitch. I love words, this has never been the skill to develop. No, the editor is the one I feed and coax. I am the poet who feels a world of difference between 'tumbling' and 'cascading' and will put the words together to minutely describe the action. And someone comes along to tell me I am being redundant because he sees only the similarities. Wonderful post, Katy. I've noticed that the more horrific the truth being written about, the starker the words must be. The words jab at us, and we're left a little dazed. I read a book recently--Between Shades of Gray--about a young girl and her family who are deported by Stalin's thugs to Siberia. The author used great restraint in her language to allow truth to shine. And yes, I struggle with this. But we must not muddy the truth with superfluous words. 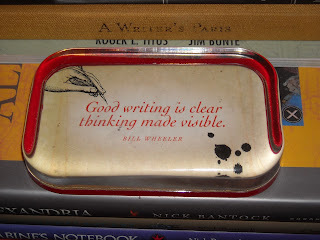 I thank William Zinsser for making me aware of cluttered writing. 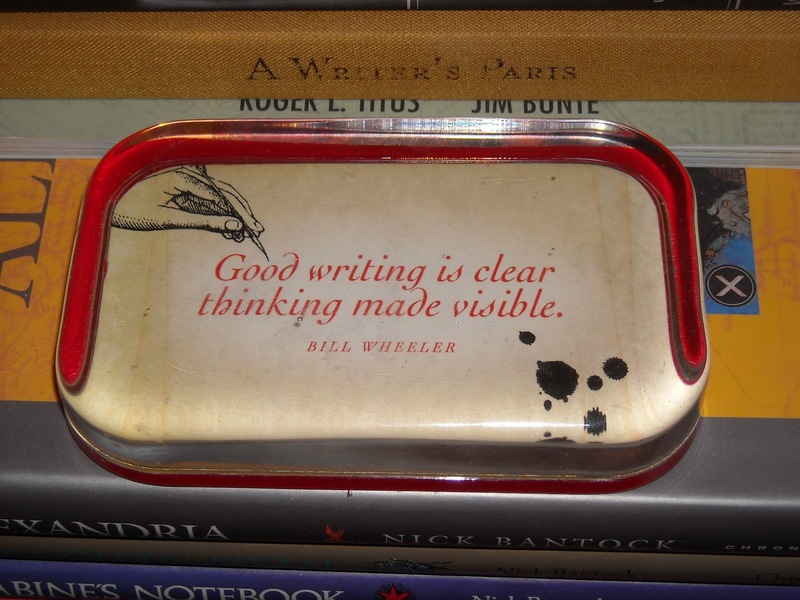 His book, On Writing Well, is a must for fiction writers too. I know this feeling. I have a series I want to write that revolves around the imagination: what is impossible, is possible. There are blue-leaved trees and pink pools of water, ducks that can fly backwards and clouds that say "Good morning" as long as you give them the proper wave. It's so hard to convey reverie when you're bogged down by the magnificence and want nothing more than to get it across to the reader . . . .
Also, God is showing me now with my WIP the sheer and stark value of telling the truth. For instance, one of my villains is refining a weapon--a small bead--that explodes once it gets inside one's body. I made to describe the carnage, and God said, "As much and as little as possible." At first I was like, "What . . . ?" But then I got it: Gray matter on the walls and eight dismembered and maimed guards laying beside where the villain is practicing, then when his next subject walks in, his side blows out, and the villain "wades through the contents of him" to leave the room. I was like, "WHOA! I get it!" I said as much as possible with as little as possible and still conveyed the horrible awfulness of this psychotic madman! Thank You, God, for your tutelage and sheer awesomeness. He's definitely without question the Author of Life. This is thought provoking, Katy. I'll pick up this thread on my post this Friday. There's so much here to talk about! I write parenting articles for a local e-zine. To give them value I always try to find a nugget of truth that people don't talk about so much, those little things that people forget when their kids get older, but parents of small children automatically go "YES!!!". The latest edition came out the other day, and my editor had tagged my piece with the words "Megan Sayer describes with startling honesty..." which bothered me a bit. My honesty is startling? Is that a bad thing? Did I say something wrong? I realised after a few days that my editor's children are nearing the end of high school, and she probably has lost her connection with the frustrations that I was describing. But at the same time the piece had a really positive response from young parents - the target audience. I'm trying to apply that to my books: truth is sometimes startling because, as you say, we're so used to platitudes. But it's truth, not platitudes, that will set us free. Cherry, yes! Hasn't the digital camera revolutionized what it means to take a picture? And to think we've had the equivalent for writers for centuries - it's called paper. Henrietta, ah, it's the outer editors that give us trouble, isn't it? Patti, yes, when terrible things are written in shattering simplicity. Will go find Zinsser's book. Foxfire, "wades through the contents" is quite a line. The thing about truth is that often the writer herself has to find it, past the noise of all we've heard and learned and accepted. That's what makes a phrase slap us awake as we read it. It's true, but we didn't see it. Bonnie, can't wait to read your thoughts. Megan, startling honesty is a good thing. In general. But not in the dressing room. I review books for a West Michigan company. Last week, the editor said, "You write short". I do. I really do. My editor on "Paint Chips" (the lovely Dina Sleiman) left many edits, saying, "this should be twice as long". Hmmm...I suppose my problem is that I need to round truth out, so that the reader identifies it more readily. Does that make sense? Susie I know what you mean. I've noticed it in your writing too, and I get it because I used to struggle with exactly the same thing in mine - what in my head was rich and full and alive somehow translated to the page as short and terse and fell much too flat and hard. For me it was when i wrote my book I ended up busting through; I felt the need so strongly to grab my reader and make sure they "got it" that I found all kinds of extra words that I never would have used if I hadn't been so aware of them. It was the difference between me trying to transcribe what I saw in my head and me trying to show the reader, literally. A great post and insightful comments. As I've gained more writing experience I've learned to pare back the superlatives and go for the simplest way of saying things by trying to choose the most specific words I can. I agree with the comment that the most painful or emotional moments are best described in the starkest way. By getting rid of the excess description the truth becomes more visible. And so much can often be said by not saying anything, and letting the reader bring their own emotions and experience to the text. I like the conversations that start on this blog. Wonder what Bonnie's going to add? For me, the "truth" only comes out when I stop worrying about whether I've got the right words and just write. When I let myself feel and then describe it, even if that means the grammar is wrong, or the sentence is fragmented. The pieces I have written like that, with complete abandonment, have gotten the most responses from readers.